It is worth noting that there is a rest day in between stages 4 and 5. The only real difference from last year's route is stage 6 which starts and ends at the new motor circuit. GC should still come down to Alto Colorado and the TT. Subject to change of course. Eurosport will have 90 minutes live coverage of each stage. The local coverage on ESPN will have a two hour show, but that could just be talking heads for the first 30 minutes. The defending champ should be back this year. 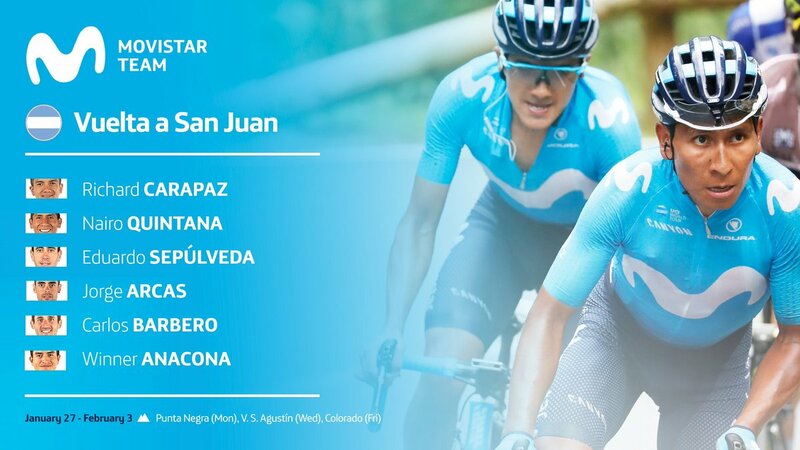 SEP San Juan also have hopes of their suspension being overturned and thus being able to compete at their home race, but would the organizers still invite them after Najar's bust? A discussion for a different sub-forum. Benoot usually hits the ground running. Maldonado is the hope for a top-ten. He did alright here last year and at San Luis before that. Eurosport to televise the race live. Rumour has it that they have also picked up the TDU. Giving both races take place when the Aussie tennis is in full swing, I expect the player to be only option available. Sagan hops across the South Pacific. We'll have to see how him and Bennett divvy up the stages. All eyes on Evenepoel, but Richeze (still had some discomfort in his knee a week ago) and Hodeg should be good for a stage win or two. The sprints should be interesting. 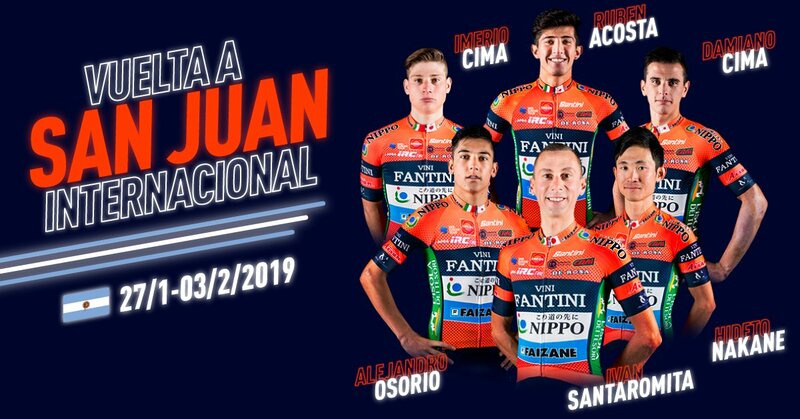 It will be a first important test for the two neo-pro Colombian climbers Osorio and Acosta, for our experienced man Ivan Santaromita and especially for Hideto Nakane appeared immediately in great condition in the pre-season tests. We will look for a good result in the hardest stages trying also to take care of the overall ranking, looking for a top 10 placement. For the fastest stages the Cima brothers are very motivated with Damiano who has already proven to be able to win and the young Imerio Cima looking for a new season of successes after an unlucky 2018 with too many injuries that stopped him. More than half the team with Funvic connections including Chaman who is a Paralympian medallist and the current Brazilian Nat TT Champ. Lauro was born with his left foot turned back. After undergoing correction surgery, he lost his ankle movements, which resulted in atrophy in the calf. Looking ahead, both Berlin and Copenhagen 6 days look likely to make significant inroads into Eurosport's promised 90 minutes, on most stages. Since I invested in the Eurosport Player in last year's Black Friday sale, I'm hoping it may provide more coverage. I thought about it too, but have Eurosport on tv from a number of nations. But it is beginning to look as if more and more cycling is heading towards the player and further cost. Won't there be a free San Juan feed like last year? 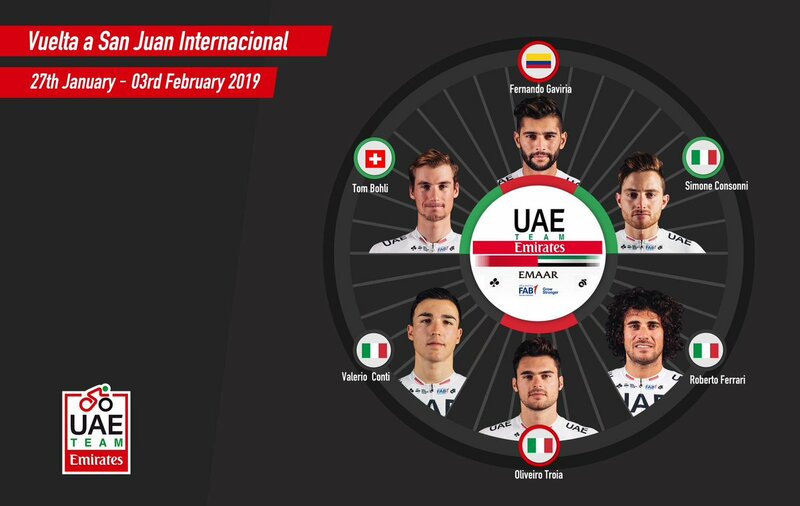 I’m really looking forward to this, not just Gaviria, but Remco and young Osorio as well as seeing Dayer Q given a chance at his new team. The sprint field may be red hot, but the GC one on the other hand...... A Sevilla repeat really wouldn't surprise me. Escuela, Rosas and Diaz are the three main local hopes for the GC. Rosas is a multiple time winner of the race (back in the pre-UCI days), but is lucky to be still riding after his quad-bike crash. Bramati Jr. His dad is in the Deceuninck car. Don't know if he's any good or not. Gamero on the Peruvian Nat team. 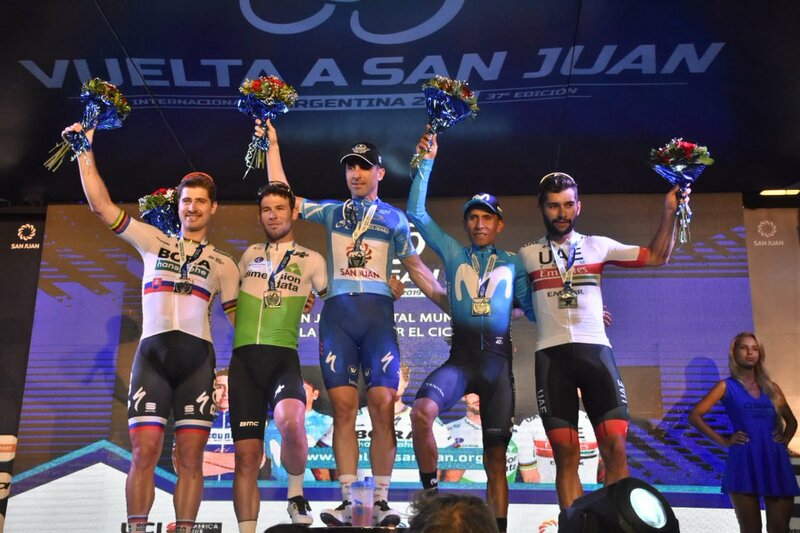 Multiple stage winner at Guatemala. Bohli should win the TT with his eyes closed. Cavendish on the comeback trail (again). 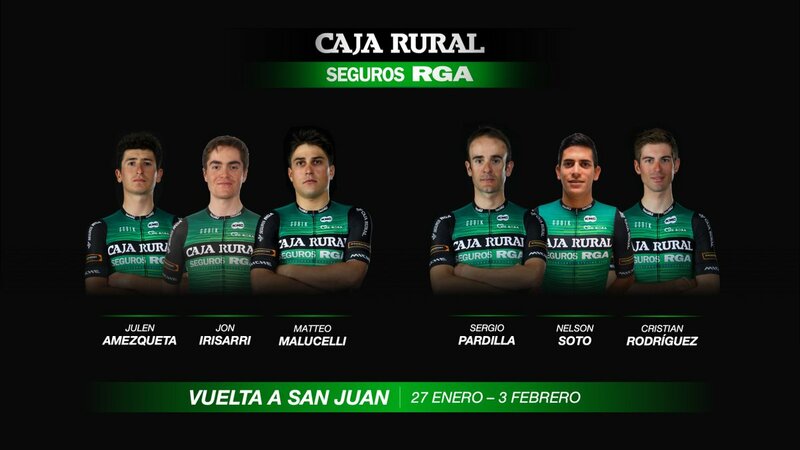 There was a series of short (13km) crits after the team presentation yesterday evening. The first one was for the WT teams, the second one for the PCT outfits (but they must have included a CT or two to even up the fields) and the final one for the remaining CT teams and national teams. Make of that what you will. Edosof have the full results. The stage obviously hasn't started yet, but I did get a brief blast of a familiar voice on the stream. Eurosport Player about to go live. Must be getting all the race from start to finish. 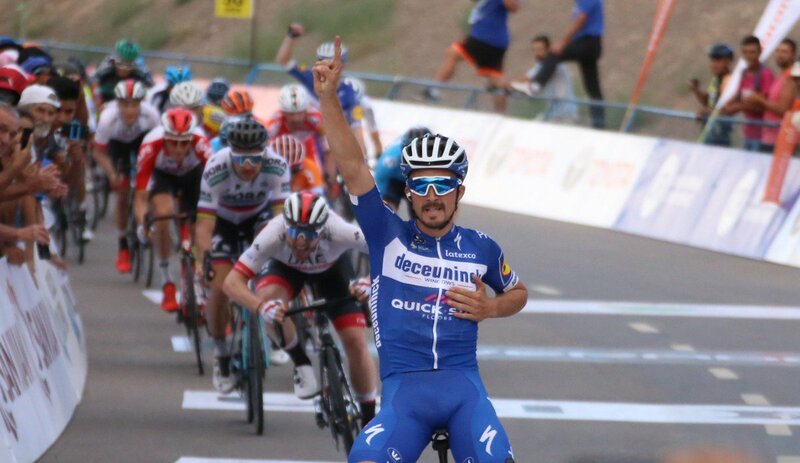 A few teams made an effort in the middle of the stage to split things up and there were several groups on the road at one point, but I don't think anyone serious was dropped and then the impetus went out of it when Richeze got a puncture. Today's stage is very similar to stage two from last year's race. Slightly different start, but the loop and climb up to the dam are the same I believe. Want to know why fourth place Luca Pacioni was on the stage podium? The organisers trusted the timing chips and didn't bother to look at a finish photo, sprint replay, or any other method to confirm the result. And as Malucelli didn't have a chip on his bike (most likely because of a bike change during the stage), they called Pacioni to the podium, thinking he had finished third. Stage shortened due to the heat. They'll do one circuit less. A few fast guys (Boivin, Balletti and Keukeleire) did make it into the unsuccessful (but not by much) chase group last year, but none had the legs or position in the group to seriously contest for, as it turned out, fourth position. It played out quite similarly to last year with three going clear with a couple of hundred metres to the top of the dam. Benoot was one of the three again, and maybe with last year in his mind he left it to Nairo to cover Alaphilippe's attack. Bad idea.